For friends who lived in and who just love Kairos. Or "Marry, Boff, or Kill", as they call it on 30 Rock, which I have unfortunately just developed an addiction to amidst studying for midterms. Go here and watch episode 113. Or, there's even an online version of it to play! I'm still not sure how blogging will work out once I start seeing patients and all, but we'll try it for now. Let me know whatcha think. I'm sorry I took so long to post these, but I'm mostly sorry I didn't take more! Like the river itself, there are no words to describe the Oregon trip. If anyone wants to caption the pictures, that would be awesome, though. Just wade through my artsy-naturey shots to get to the fun ones. Come as you can into and out of Portland and Eugene, coordinating with the people you MUST see. 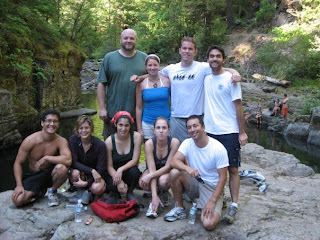 And I will say: I am going to invite the folks from Mississippi from the first Oregon trip: Aron, Laura (who's now married), Edlyn, Mike Cormack (who's also now married to his wife Crystal, who's expecting). Aron is finishing Ed. school this summer in Portland and I would imagine she can come for sure. In choosing airports, realize that coming in groups would be nice for whoever has to be dispatched to get you ( mostly, I would think, me). The cabin is about twenty minutes off I-5, twenty miles SOUTH of Eugene. That means that Eugene is easiest if you're coming in mid-week. Then again, to see any of you, I'd drive as far as necessary. Of course, if you're West Coast driving in your fuel-efficient vehicle would be extremely smart, and the trip straight to the Cabin is only 8 hours from the Bay Area. I propose as base the River cabin, a location most of you saw on the last Oregon trip (though I think we had bad weather at that point). I am not at a wealthy point in my life. The cabin will mean little cost to anyone in lodging, excepting one proposed journey to the coast at some point mid-week if you guys desire, and perhaps one night in Portland if a lot of people are flying in or out at similar times. At the river cabin, which is now equipped with a HOT TUB and FLATSCREEN TV/DVD, we will relax, perhaps go up the road and camp for a night, perhaps kick to the coast to revisit the Tillamook cheese factory and the Pelican Bay Brewery, but mostly remain at our own private house and river. Scheduled Events, as brainstormed by the group and requested from this list, may include: a partial En Fuego ensemble reunion performance, a poker night, a badminton or ultimate Frisbee mini-tournament at the field in back, a bike tour on the gentle, twenty mile bike path to and from the town of Cottage Grove, a free whitewater kayak trip (my father owns three hard-shells and three two-man inflatables) to the nearby, world famous Umpqua or Mckenzie Rivers, and so on. You can be there. Or it can be your loss. Speaking of loss, I've recently ended up broken-hearted and single again. A story too painful to tell here, though if you call I'll answer, or actually call you back (I can hear Jess, with whom I've been playing phone tag for the last four months, choking with laughter in the background. But I'll try). I am putting down my number here: (541) 510-7864. My email is mcopperm@uoregon.edu. Call (and leave your number unless you're sure I have it!) or email-- let me know. I will update the plans here as time goes on. I dearly hope to see you all.